Difference between revisions of "Nintendo 3DS emulators"
;NCSD-type: Includes '''.CCI''' (Citra Cart Image), aka '''.3DS''' - data on physical carts, can be executed right off the bat, not used much since no one bothered to develop a CFW solution to load them yet (besides converting them to CIA) and only overpriced flashcarts (Gateway/Sky3DS) can load them. ;NCCH-type: Includes '''.CIA''' (Citra Importable Archive) and '''.CXI''' - installers that unpack game data to the SD card or the 3DS NAND memory (if you have a ticket proving ownership of that game, but tickets can be shared and even fool Nintendo's servers into letting you download the game, using tools like FreeShop or Wii U USB Helper if on a PC). Some homebrew apps (FBI, DevMenu) can install CIA files on 3DS systems with CFW installed. Digital only games will use this format internally. ;NCCH-type: Includes '''.CIA''' (Citra Importable Archive) and '''.CXI''' - installers that unpack game data to the SD card or the 3DS NAND memory (if you have a ticket proving ownership of that game, but tickets can be shared and even fool Nintendo's servers into letting you download the game, using tools like FreeShop or Wii U USB Helper if on a PC). Some homebrew apps (FBI, DevMenu) can install CIA files on 3DS systems with CFW installed. Digital games are often distributed as CIAs. Note that Citrus, Citra or CTR is the internal code name for the 3DS. 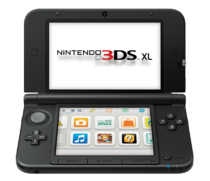 Includes .CIA (Citra Importable Archive) and .CXI - installers that unpack game data to the SD card or the 3DS NAND memory (if you have a ticket proving ownership of that game, but tickets can be shared and even fool Nintendo's servers into letting you download the game, using tools like FreeShop or Wii U USB Helper if on a PC). Some homebrew apps (FBI, DevMenu) can install CIA files on 3DS systems with CFW installed. Digital games are often distributed as CIAs.